The VW TDI (Diesel) engine of 2005 is prone to problems with the oil pump assembly. The oil pump that came in the car is chain-driven and the pump also drives the balance shafts that smooths the engine vibrations. VW has updated the balance shaft and oil pump assembly to a gear-driven unit. The chain and chain-tensioner of the original style assembly wears and creates slack, lowering oil pressure. This can eventually break and cause no oil pressure and severe engine damage. The oil pan needs to be removed to gain access to the assembly. (This also requires lowering of the sub-frame assembly.) 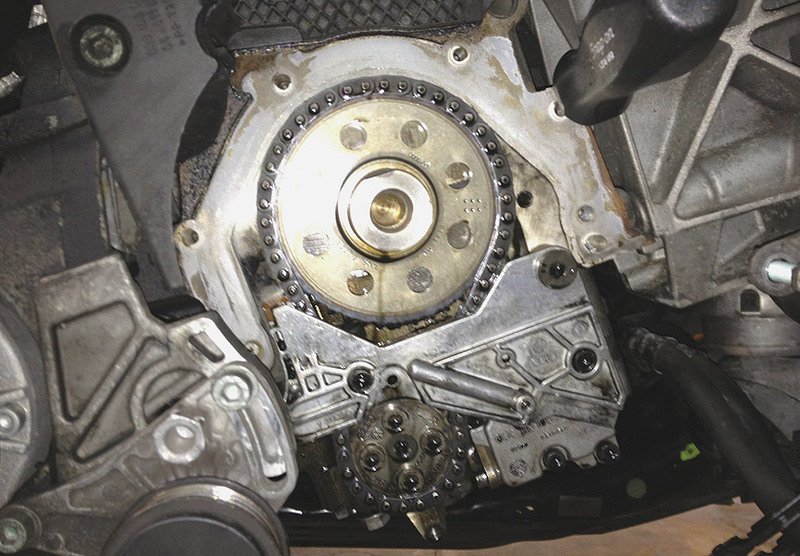 The front lower timing cover / crankshaft seal fixture needs to be removed and the factory chain-driven gear pulled off the front snout of the crankshaft with a special puller. Ours came right off with the special puller. We’ve heard of difficulties removing the gear and having it break and needing to be chiseled or cut off. 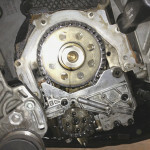 The new crankshaft drive gear needs to be heated to the proper temperature and it will slide right in place. There is no key-way for the drive gear. The balance shaft assembly is timed with a special lock tool. The oil pan and lower timing cover are sealed with sealant only — no gasket. Special VW approved Diesel oil must be used in these engines.